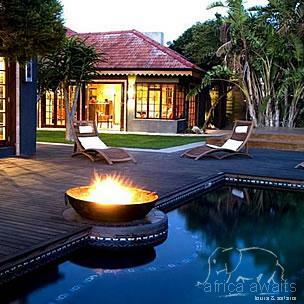 Named for the mystical dragon-lion of Indonesian mythology, this luxury boutique hotel in PE is one of five select lodges brought to you by Lion Roars Safaris & Lodges, and offers distinctive 5-star accommodation in Port Elizabeth. Setting itself apart from the “every-room-looks-the-same” standardization of the major hotel chains, this luxurious modern fusion of Eastern & African architecture and décor is an artistic masterpiece. Each of the twelve suites at our 5-star boutique hotel is a unique space that not only provides deep comfort, but also inspires and enriches your journey. The tranquil, leafy oasis includes a private gym & holistic treatment room, where you can indulge your body as well as your senses, and rebalance mind and spirit in a truly remarkable space. 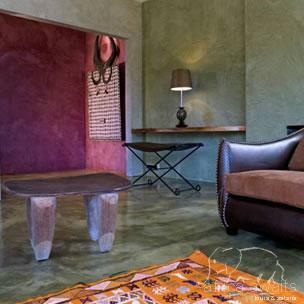 Each of the 11 suites is distinct in its architecture, décor, artwork and furnishings. Returning guests are offered a fresh experience with every visit. Hand crafted screens inlaid with fine fabrics and silks, antique doors and selected objéts d’art, furniture from Africa and the East, and hand made ceramic tiles of beautiful hues and patterns create a layered visual experience in every room. Murals, pillars, plinths and frames crafted by local artists all contribute to the aesthetic experience. The aesthetic experience aside, the suites at Singa are designed around your comfort: the suites are spacious, and separated from each other by lush tropical gardens, creating a delicious sense of privacy. All beds are king size and extra length, and our linen, robes and slippers are world-class quality. And for those who believe no bathroom can be too luxurious, Singa’s sumptuous bath and shower rooms are temples to the art of bathing. No less functional for its beauty, each suite is also equipped with wireless connectivity, flat-screen television with DSTV and DVD facilities, and i-pod docking station. 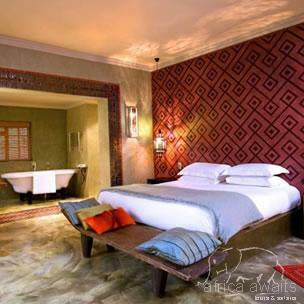 Singa Lodge offers 9 luxury suites and 2 executive suites. Singa offers all our guests a sumptuous gourmet breakfast, served in the dining room overlooking the garden and pool. From a buffet of fresh fruit, top-quality meats and cheeses, and a selection of gorgeous breads and pastries, guests move on to a cooked breakfast of their choice, washed down with fresh, hot coffee and refreshing fruit juices. Later in the day, as the sun sets over the wide sweep of the bay, guests gather for cocktails in the intimate quiet of the outside lounge and bar, enjoying a peaceful moment and listening to the sound of the sea in the air. After sundowners, Singa’s gourmet dinner menus can be enjoyed in the private dining room, outside in the sitenge lounge, or privately in the suites. After dinner, there’s a choice of relaxing in the indoor or outdoor lounges, or heading up to the reading room for a fine selection of single malts and cigars, personally selected by Singa’s malt-enthusiast owners. Singa is also a unique and distinctive venue for functions, where we work with our clients to design and deliver world-class menus. While we are continuously designing and testing new menus to offer to guests, our chefs are always glad to work with you to customise a menu to suit your specific tastes. With your holiday, safari or business trip from in to Singa Lodge in Eastern Cape.